So no house slippers today but that’s OK. Having a mouse to use with the lappy makes it all worth while. It’s the little things, people. None of my original “cards” ideas happened. But that’s OK. Going with the flow here. And besides, if I had even attempted any of them, I would have spent half of the time cleaning up the messes I made. Which is why I didn’t attempt them. But yeah… I got nothing. 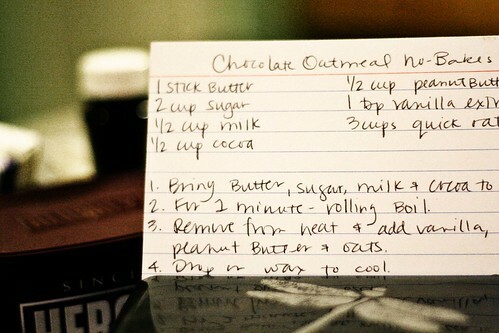 A recipe card. And a rather good recipe too. It’s my Mom’s chocolate oatmeal no-bake cookies. Some call them drop cookies, others stove top cookies, or just plain ole chocolate oatmeal cookies. Easy to make. Even easier to eat. NOM! Next week’s challenge is “up.” I’ve been looking forward to this one since the list came together. So many different ways to interpret and I can’t wait to see the creative minds. Don’t forget to check out the flickr pool’s photos or click on the challenger roll page to see everyone else’s photos. Take your time and browse through more of their flickr photos – there are quite a few super creative photog people playing along! 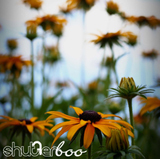 ~ by shutterboo on February 10, 2010. Umm hello…you cut off the sides! 3 cups quick what??? quick oats. because they’re oatmeal cookies. and awesome. make them. now.